Austrian band Desert Sin arrives with their second project Destination Paradise, and the band has left little to speculation. The tunes on this album are an extension of 2009's The Edge of Horizon. However, this does not suggest a redundancy, but more a comfortable assurance of a band who knows their style of metal. Desert Sin's metal is melodic and traditional, with obvious nods to power metal. Destination Paradise is a well-balanced album, especially as it pertains to the musicianship, the contribution of the members. I listened to several albums lately where on person/instrument dominated the recording. Not so here. Additionally, the clarity of production is at a premium, very crisp and natural. To the songs, many have an inherent epic feel, like Circle of Twilight, Follow Me, or Creation, sometimes due to the synth layer, but more likely because of the drama created in composition. Desert Sin can also feel a bit more raw and heavier as on Kill the King (which is not a Rainbow cover). Epic is stirred with clever accessibility on the quite pleasing Would You Release Me. Overall, between the sound musicianship and song composition, Destination Paradise delivers solid melodic metal. It's not overly profound or innovative, but it is entertaining and hits the mark for that classic metal sound. Recommended. 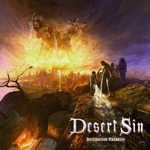 Between the sound musicianship and song composition, Desert Sin's Destination Paradise delivers solid melodic metal. It's not overly profound or innovative, but it is entertaining and hits the mark for that classic metal sound.